Line One: Add Personalization Or Monogram! 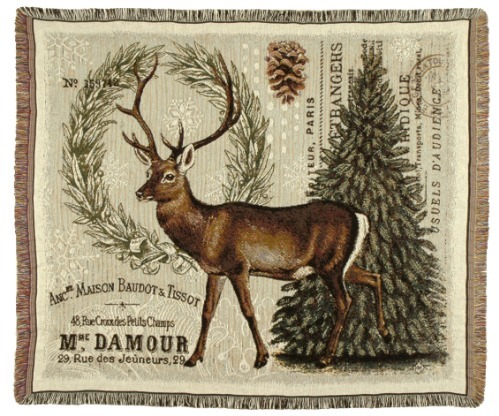 Personalized Winter Woodland Deer Christmas Tapestry Throw. This is the perfect throw for Christmas, look at the design on the throw it is so beautiful with woods like colors to fill any ones Christmas home decoration. The deer is so cute a adorable as it stands near a Christmas Tree. The deer throw give the love for the woods in anyones heart while keeping the design as a old style vintage decoration. Tapestry Throw size 50"x70" made of 100% cotton, machine wash cold on gentle cycle, tumble dry on low heat. (C) Jack Sorenson, Licensed by Rich Wiseman. Made in the USA.